The Wigan Badminton Tournament returns this year in December with events for both social and league players as well as juniors. 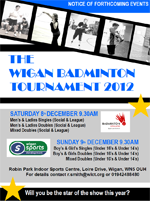 The tournment will take place on Saturday 8th and Sunday 9th December 2012 at Robin Park Indoor Sports Centre. For more information and to enter, please get in touch with Richard Smith.